Nice curves: The new iMac makes GG smile every morning when he sees it in his office. For the past month, I have been fiddling around with the new 20-inch Apple iMac, which takes the company’s signature integrated design to another level—a sleek, suspended aluminium and glass slab with just the power cord. Even the rear end of the iMac, which I first gaze upon through the cabin glass as I walk into my office in the morning, is a beautiful, flat, light-absorbing black, offset by a large, glossy black Apple logo. The iMac sits on a single slim foot—like the older iMacs—and you can tilt it to set the angle of the screen. The 20-inch glossy widescreen display, sitting flush on the almost seamless front panel, provides incredibly crisp images—great for photos and movies. Made of aluminium and plastic, the new keyboard is much thinner than the old all-plastic one with flat, shallower keys. The right-hand function keys from F7 to F12 are now the multimedia controls, which work with iTunes and QuickTime out of the box. The keyboard has two USB 2.0 ports on the back, an improvement over the USB 1.1 ports on the back of the older Apple Keyboard, as I find it very convenient to hook up flash drives and card readers. The iMac I reviewed came with a 2.4-GHz Intel Core 2 Duo processor, 256MB ATI Radeon HD 2600 PRO graphics chipset, with 1GB of 667-MHz DDR2 SDRAM (the iMac supports up to 4GB of memory) and a 320GB hard drive. The iMac’s 20-inch display has a resolution of 1,680-by-1,050, so it is optimal for displaying 1,280-by-720 HD content at full resolution, and playing back QuickTime-encoded movie trailers at 480p, 720p, and 1080p full-screen was smooth and stutter-free with colours that pop off the screen. Performance on Photoshop CS3 that I use quite a bit was impressively fast, perhaps aided by the fact that CS3 is finally optimized for Intel processors. For a bit of fun, I even turned the iMac into a fast and capable PC running Vista with the aid of the Boot Camp software. The iMac comes bundled with the new idiot-proof iLife ’08 suite which makes it remarkably simple to use digital music and photos in videos or movies that can make you a YouTube god. You can hook-up camcorders and digital cameras via USB or FireWire, but the iMac still doesn’t have a digital card reader built in, the unfortunate omission in such a multimedia-optimal desktop. 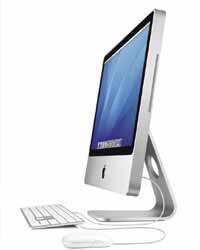 The iMac includes built-in AirPort Extreme 802.11n Wi-Fi networking, Gigabit Ethernet; a total of five USB 2.0 ports (including two on the new Apple Keyboard); and one FireWire 400 and one FireWire 800 port. And hey, the high-quality iSight video camera is great for Skype users. There’s also HDCP support built in, so future support for the next-gen Blu-Ray and HD-DVD is pretty much assured. HDCP stands for High-bandwidth Digital Content Protection and is an Intel-initiated program that is mandatory for high-definition playback of HD-DVD or Blu-Ray discs. If you want to watch movies at 1980x1080, your system will need to support HDCP. If you don’t have HDCP support, you’ll only get a quarter of the resolution. So, why would I need a big fat ugly box attached to my LCD monitor? Quick specs: 2.4GHz Core 2 Duo CPU, 1GB RAM, 320GB HD, 20-inch 1680x1050 LCD, slot-loading 8x SuperDrive (DVD±R DL/DVD±RW/CD-RW). Just launched at the time of writing this review: Mac OS X 10.5 Leopard, Apple’s first major operating system upgrade since Tiger more than two years ago. The changes include more than 300 new features, and it may be worthwhile to consider this OS to be included in your shiny new iMac.